If you’re anything like us, you like to get the inside scoop. To see what is happening behind the scenes, how does it work, what happens if we change something? Tower Engineering had a unique opportunity this week to work on a video project for one of our clients. While we can’t give many details, we can give a little inside scoop to the workings of video footage. Our CEO and two Vice Presidents participated in video interviews. The lobby of our office, headquartered in Raleigh, NC, was over-run with power cords, lights, cameras, and people for the full day shoot. The office was a buzz that day of people curious to sneak a peak at the process. We’re pretty casual here, so seeing the executives dressed up, wearing polos shirts and jeans, people take notice. It was not the first time our CEO, Andy Haldane, has been featured in a video. 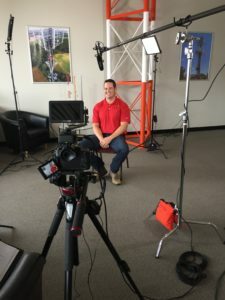 He was on the Discovery Channel’s Hazard Pay showcasing some of the unique engineering and climbing work we do. Even as a seasoned veteran, Andy had some nerves. “It’s a bit awkward to have cameras and lights on you.” Overall, he described the experience as fun and noted that it’s great to see TEP participating in unique marketing techniques and hopes to participate in more as time goes on. 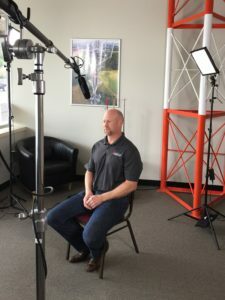 Brad Little, VP of our Design/Build group was also excited for this unique opportunity. He admitted to some nerves, and opted to jump in with little preparation. “I listened to the interview before me and just rolled with it.” He said he kept looking at the camera rather than the interviewer. 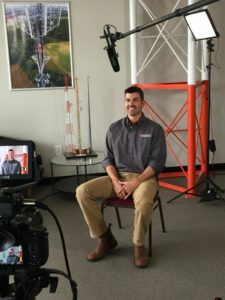 Even though Andy, Brad, and Mike each described being on camera as a bit awkward, they look forward to continuing to represent TEP in innovative ways moving forward and are thankful for the opportunity to showcase TEP to new clients as we continue to develop innovative engineering and design solutions. If the video interview gets any of the buzz we had internally at the office, it’s sure to be a success! Want to learn more? Want to join our team?